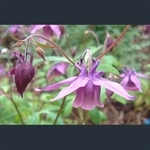 There are dozens of species of Aquilegia, and hundreds of hybrids. The species range from small alpines from high in the mountains to tall plants from woods or meadows, which would be at home in a herbaceous border. The ones we offer include excellent and reliable rock garden plants and others that are unusual or new in cultivation. They come from all round the Northern Hemisphere. See also Semiaquilegia. Compact clump of foliage with maroon and yellow flowers on slender stems. 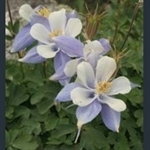 Blue sepals, long-spurred, and white petals; from the Rocky Mountains. White-flowered form of this dwarf species. Dwarf, with white-centred blue flowers above grey-green leaves. Lovely burgundy flowers with yellow cups and curved spurs. Elegant, dusky purple flowers on slender branched stems. Large, lilac-blue flowers above the foliage in spring.